A research team at the Hong Kong Polytechnic University (PolyU) claims it has successfully developed the most energy-efficient LED filament technology with a luminous efficacy of 129lm/W, which represents 1.5 times the efficacy of traditional LED lamps, surpassing all other general lighting tools available in the market. This LED filament technology has excellent energy efficiency. 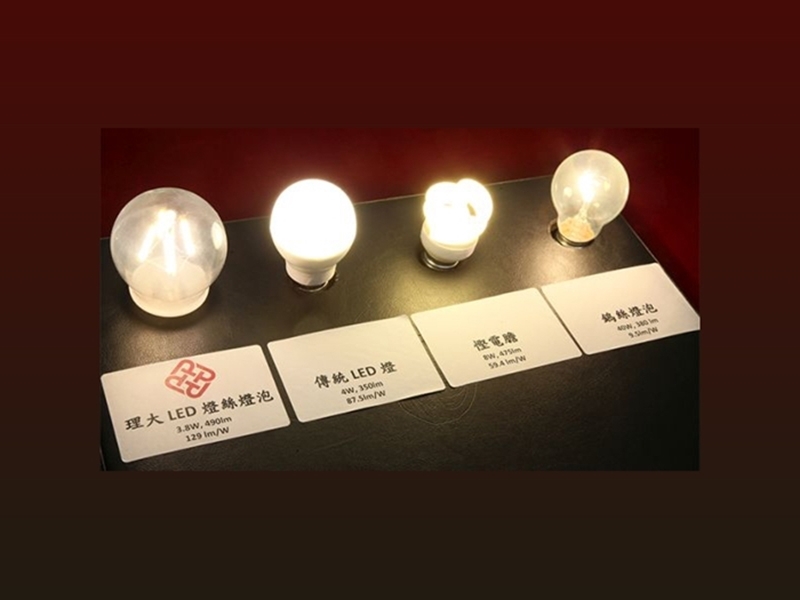 Based on the assumption of a daily operation of eight hours, a PolyU's LED filament bulb with lumen of 1300lm costs HK$33 (USD 4.2) of electricity tariff per year, and contributes to 22kg of carbon dioxide emission per year. In comparison, a traditional LED lamp costs HK$47 (USD 6) of electricity tariff and 31kg of carbon dioxide emission yearly with the same lumen and conditions, which means that the new technology can reduce carbon dioxide emission by 30%. Besides, the new technology enables an expected lifetime of 50,000 hours, with only half of the production cost of traditional LED lamps. 4. More environmental friendly: Absence of harmful chemicals, and consists of less electronic components, and 80% of recyclable materials. Instead of ceramic and sapphires, Aluminium, with good thermal conductivity, high reflectivity and affordable price, is chosen as the substrate material, to achieve longer lifetime and higher lumen at a lower cost. This design will reduce energy loss and generate even light diffusion, without affecting luminosity. Applying advanced injection moulding technology developed by PolyU Advanced Optics Manufacturing Centre, a seamless and transparent spherical plastic case is produced to make 300-degree beam angle possible. PolyU LED filament lamp converts AC (alternate current) to low current DC (direct current) directly without dealing with the voltage, and hence reduces components required and simplifies circuits, enhancing reliability and efficiency of the lamp. https://www.megasan.com/en/optoelectronics you can check out our led products.